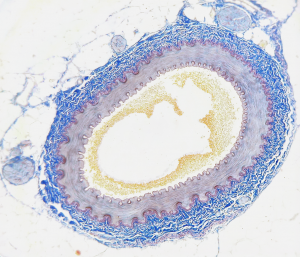 (from Greek ἀρτηρία (artēria), meaning “windpipe, artery”) are blood vessels that carry blood away from the heart. In this electro-acoustic piece, which forms part IX of a larger piece for cello solo, electronics and visual performance, I have imagined this vessels, pulsating blood through the body. Formally the piece contains 2 “parts” building a sort of arch, or increase/decrease of blood pressure of you will. The first part is static in its character, with one sound with different microtonal changes in the 6 channels respectively. The second part, by contrast, is very varied with different information being sent through the ”arterias”, so to speak. All sounds are electronically produced and the whole sounds-scape is clearly electronic. 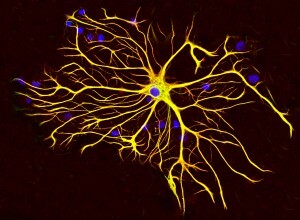 astrocyte (Astro from Greek astron = star and cyte from Greek “kyttaron” = cell) are characteristic star-shaped glial cells in the brain and spinal cord. Recent research (2015) has shown that these cells have a important role to help the brain to remember. They have also been showed to occilate. In this electro-acoustic piece, which forms part III of the piece “Ontology of Becoming” for cello solo, electronics and visual performance, I have imagined this “cell – world”; how these cells sends information and how that may sound like. Formally the piece contains 10 “phrases” of different lengths. (These different phrases; their lengths, construction etc. are connected to the piece in its whole and could be regarded as a way at looking into the brain and see, through the astrocytes, how it treats the memory (and pre-memory) of the piece… a kind of information flow of every part… but condensed). astrocyte forms the 3rd part of a large scale work for cello, electronics and visual performance. The visuals are by Thomas Marcusson. The whole underlying structure of this piece is drawn from various features found in Japanese Nō Theatre. There are three types of tempo in Nō (Hiranori, Chūnori and Ōnori) which is articulated by the tripartite structure of this piece, all having its own pace. These three parts are (approximately) divided in the proportions 4733 and 6647 which makes: A = 169 seconds, B = 119 seconds, C = 84,6 seconds. On the more poetic side the piece is a sort of comment to an imagined Nō play drawing its form, intervals and rhythmic patterns from the Nō piece “Chū no mai” which, as it were, is acting like a sort of “cantus firmus” but only revealing itself the very last seconds. Material used: Chū no mai (trad. 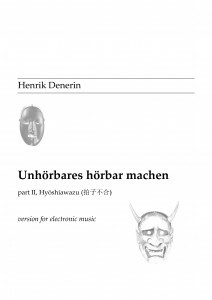 Nō), recordings (wine glasses, scraping on string, knocking on wood), sound synthesis and recordings of works by H. Denerin (Alcheringa, Le theatre du temps, Rotations-Shadows). Tools used in composition process: Max/MSP 6 (granulation, synthesis, stochastic sound mass, sound freeze and more, all programmed by H. Denerin), IannisX (fractal walk), Ircam’s SPAT (spatialization), Cubase (mixing). ROTATIONS – The piece consists of 48 different voices whish all has its own shape, range, dynamic envelope, sound composition, tempo and rhythm. Every one of these voices rotates at different speeds around the room; the slowest taking 21 minutes for one rotation, the fastest 0.5 seconds. An unbelievable room-polyphony is created. 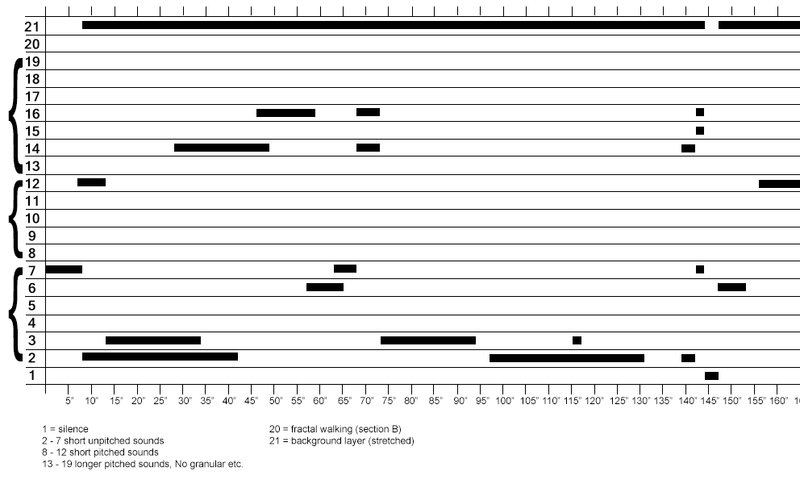 Obviously not all 48 voices are heard all the time, but in the most dense part, at 15 minutes, they all come together. 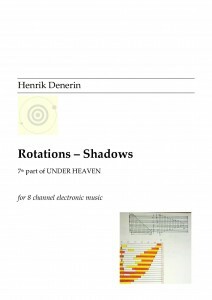 The different voices in ROTATIONS-SHADOWS where all created from one original melody with the use of IRCAM open music, mainly with different scale objects applied both vertically and horizontally. The sounds where created with Csound and the spatializing with IRCAM Spatialisateur. Under Heaven is a cycle consisting of 7 parts, each for different kinds of ensembles. They are all composed of the same material and using similar ways of forming. This, however, does not mean that they don’t have a personality but only belong to different cultures – different ways of growing.